This is the best home golf hitting mat available. Weighing in at 38 lbs it won't slide like smaller mats and yet it's still small enough to carry. 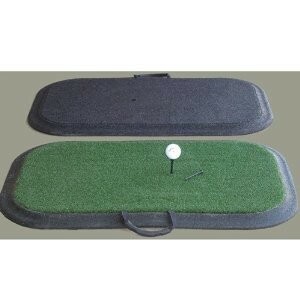 The Birdie Turf Practice Mats are perfect for both Birdie Balls and for conventional golf balls. Set includes One pad for standing and One Turf pad hitting sufrace. BirdieBall® is the best golf training aid invented this century! That's a bold statement, but golf coaches and PGA golf instructors around the world agree!